The Capitals are back in the Stanley Cup Final for the first time since 1998 and the city of Washington is buzzing. Captain Alex Ovechkin and his teammates are just two wins away from eternal glory and the city has been in full force during the team’s run. 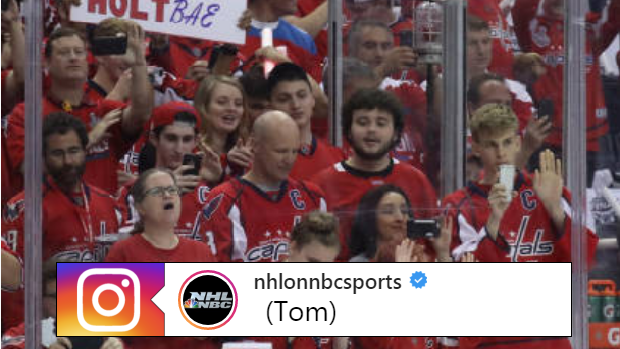 Fans have packed the Verizon Center with all sorts of props and signs, but the best arguably came during last night’s Game 3 tilt. A fan cleverly made a reference to the film “Castaway” by painting the iconic “Wilson” ball with red paint. The painting, of course, was made for Washington’s hard-hitting forward Tom Wilson. In case you’ve never seen castaway, Wilson is the volleyball that Tom Hanks’ character Chuck Noland turns into his lone friend on the island. Wilson has been at the centre of controversy over the playoffs. He’s committed countless questionable hits that have turned him into enemy number one for opposing fans, but at least his own fan base is finding unique ways to support him. Of all the signs/props we’ve seen so far throughout April-June, the best came during the Western Conference Final, when two Calgary Flames fans were spotted in Winnipeg’s Whiteout rocking a hilarious sign at Bell MTS Place. Expect some more creativity to surface as the rest of the series unfolds.